360° OMNIDIRECTIONAL SOUNDFIELD: Enjoy truly rich sounds whenever you are seated in the room. LED STATUS INDICATION: A specific light will illuminate on the top panel. HI FI DESIGN - WOOD BOX: Vocal sound clarity, a full range for multimedia and a rich bass for music. EASY INSTALLATION: In a matter of minutes you can install the PentaClass using the supplied mount on a ceiling or wall. REMOTE CONTROL: Remote control for the easy operation of your PentaClass. AUDIO PRESETS: Choose voice, multimedia and music EQ presets. 1300 SQFT (120 SQM) COVERAGE: Suitable for room sizes of up to 1300 ft2 ( 120 m2). UPGRADABLE: Upgrade from the PentaClass A to PentaClass AB or ABM version (Replaced by PentaClass Runa). 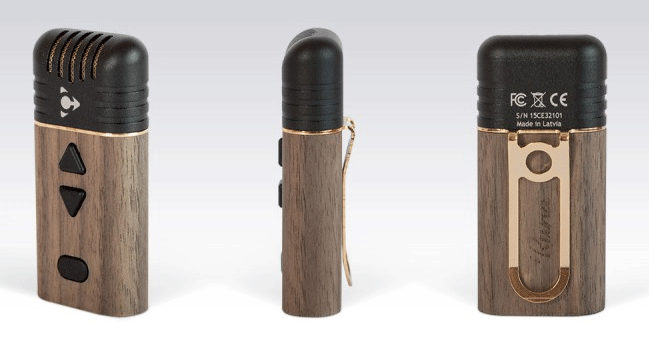 TWO COLOUR VERSIONS: Dark walnut or light oak - choose best fit for you. 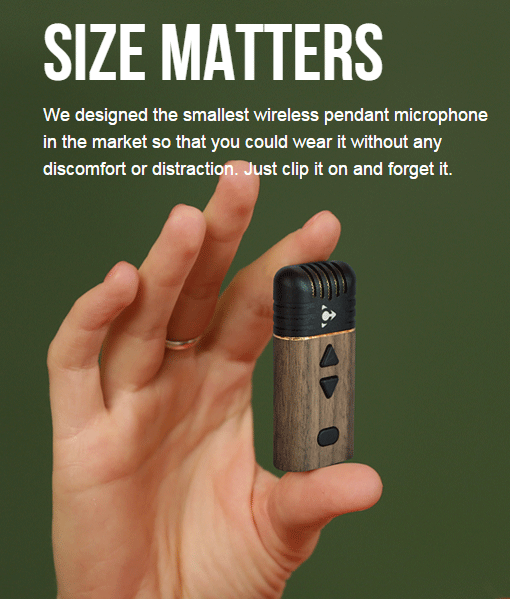 THUMB SIZE MICROPHONE: Thumb size wireless pendant microphone, so small, that you’ll forget, that you are using it. THREATED AS PEACE OF JEWELRY: Beautiful for every day use and wearing, handmade from wood. 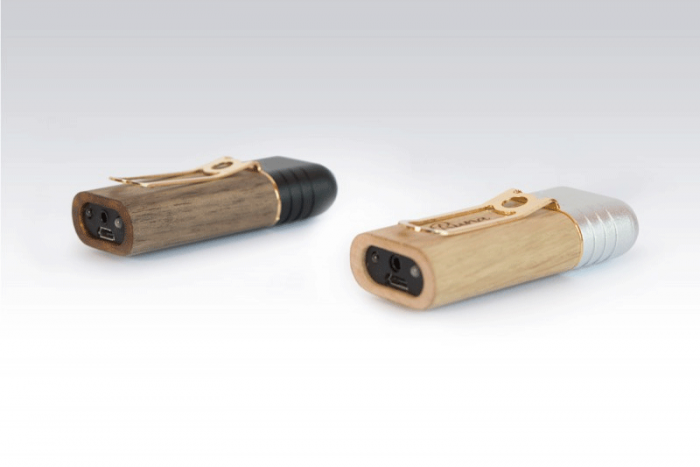 LONG BATTERY LIFE: 7 hours battery life with one charge, charge it with standard mini USB charger. CONTROL IN YOUR HANDS: Built in remote control for Certes PentaClass audio system. TWO WEARING OPTIONS: By clip or by lanyard - choose which fits best for your todays’ outfit. POINT TO POINT CONNECTION: with Certes PentaClass audio system - no accidental connections will bother you. EXTERNAL MICROPHONE CONNECTIVITY: Convenient solution for those who prefer wear headset mic. What is the difference between PentaClass models? PentaClass A comes with one wired analog audio input, the PentaClass AB comes with Bluetooth® connectivity in addition to the wired analog audio input. 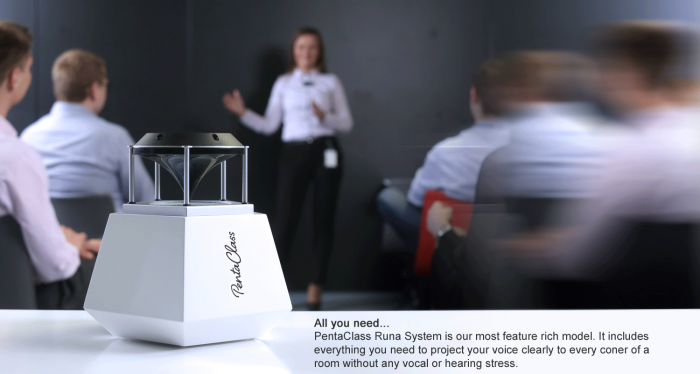 The PentaClass Runa comes with a wired analog input, Bluetooth® connectivity and a wireless Microphone receiver and transmitter. Does the microphone need a battery? No, the PentaClass microphone has a rechargeable battery that can be charged by connecting the microphone to a DC plug or a PC using the supplied USB cable. How many microphones can be connected to the PentaClass simultaneously? 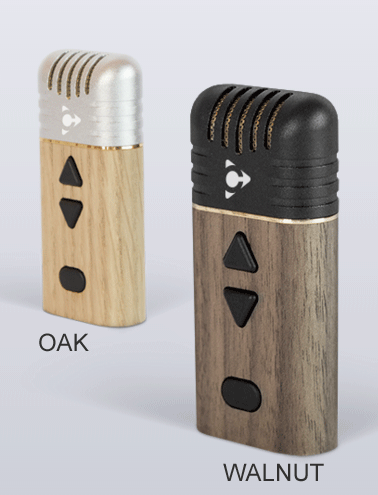 At the moment you can connect just one microphone to one PentaClass speaker but soon we will be launching new version with dual microphone connectivity. How many devices can be connected to PentaClass Runa? 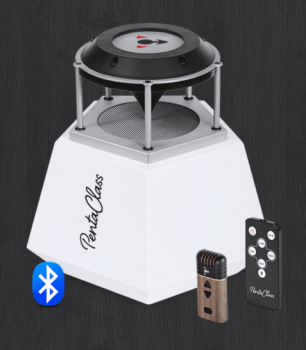 PentaClass ABM can be connected to 3 external audio sources with an audio cable, Bluetooth and microphone. Will the PentaClass microphone we got with the PentaClass Runa work with the other PentaClass AB we purchased? No. You will need to have your PentaClass AB upgraded with the microphone upgrade pack to work with the PentaClass microphone. What is the best placement for Certes PentaClass microphone? The microphone should be placed approximately 10 cm from your chin for best performance. If you are using the lanyard you can adjust it to the proper length as described in the user manual page. If you are using the clip just attach the microphone to your clothing approximately 10 cm from your chin. Does PentaClass Runa have second microphone. No, the PentaClass Runa system comes with one microphone. How do I connect the Certes PentaClass Runa to my Bluetooth device to stream audio wirelessly? 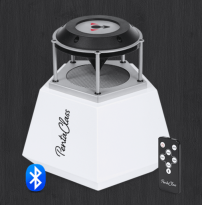 • Connect your device to the PentaClass Bluetooth channel. How many radio channels does the PentaClass Runa have? You can connect one external audio source via Bluetooth®, such as a mobile phone, tablet or PC to the PentaClass AB or Runa models. The PentaClass Runa model has an additional 2.4 Ghz channel for connecting it to the microphone, but this channel is intended for the microphone only. Do I need any additional amplifiers for PentaClass? No, all PentaClass audio speakers have a pro quality built-in amplifier. Is it easy to install PentaClass? Yes, you just need a drill and screwdriver to install the PentaClass on a wall or on a suspended or concrete ceiling – it takes about 20 minutes. However, if you put it on a table, you don’t need any tools – it is ready to go as soon as you take it out of the box. Do we need a specially trained person to install the device? No, the PentaClass can be installed by anybody who knows how to use a screwdriver. Can I use PentaClass with my interactive whiteboard? 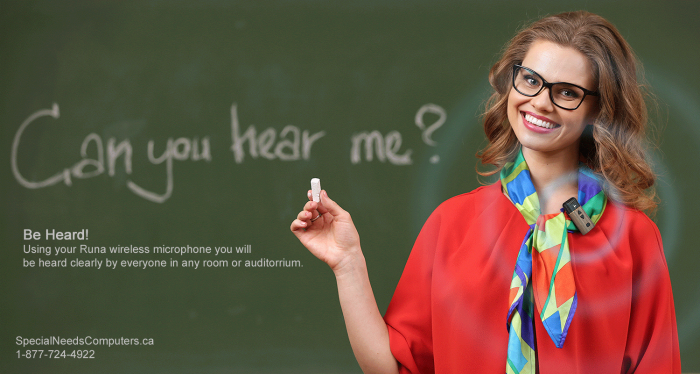 You can use it with your interactive whiteboard, projector or with any other audio source. Does PentaClass need an electrical socket? Yes, the PentaClass speaker must be plugged into an electrical socket. If you decide to mount the device on the ceiling we can also offer a long-run power cable. What should I do if I have bigger auditoriums than 120m? How can I install the PentaClass in larger auditoriums? You can daisy chain up to 3 PentaClass speakers. The first one acts as the Master and the other two will be slaves. Connectivity can be made using an audio cable with a 3.5mm jack – from the Master output to the slave input. In daisy chain scenarios the supplied remote control will control the Master PentaClass and thereby control the slaves as well. If I have a problem with my PentaClass where do I get support? Please contact your nearest reseller. If you cannot find one nearby please contact us directly. I cannot find my user manual, where can I download one? All product literature can be downloaded at the Support page of our website under downloads or you can just click here to go directly to the download page. We will need a power supply for the USA rather than for Europe. Will our PentaClass come with this? 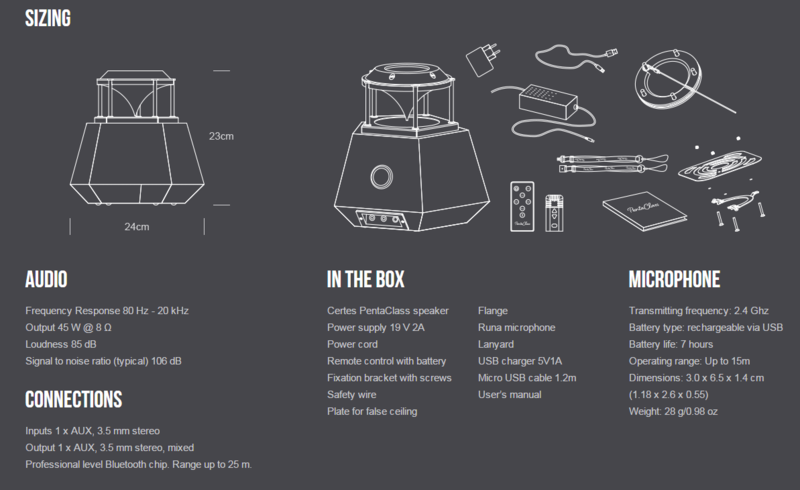 Yes, your PentaClass will come with a power supply appropriate for your area of the world. Certes PentaClass ABM comes with the smallest teacher’s microphone on the market, which is not bigger than a thumb, with a size of 60x25x13mm (2,36”x0,79”x0,39”), it weighs just 20 grams (0,71 ounces). 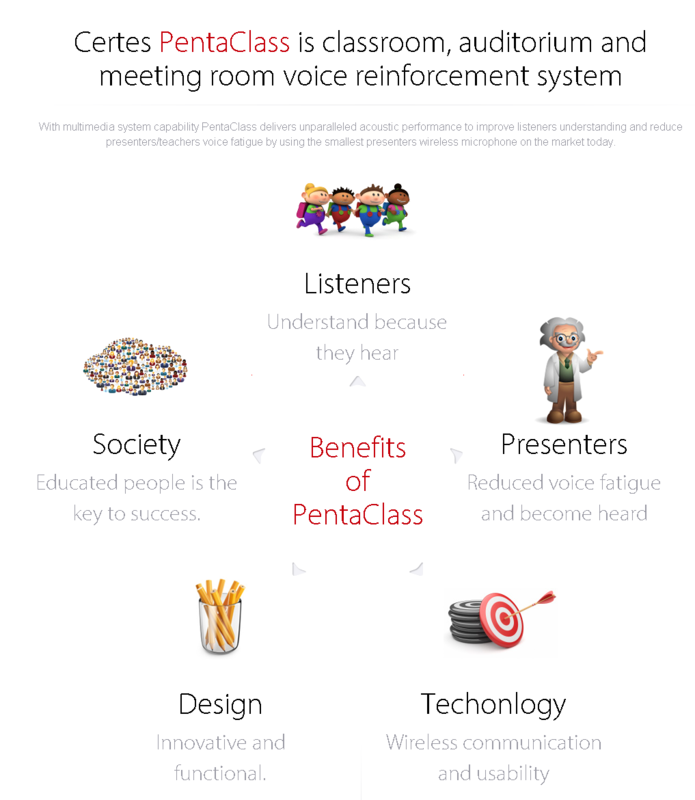 As the system has an auto-pairing feature, it can be activated with just two simple actions – turn on PentaClass and turn on the microphone. Thanks to its size, the microphone can be worn with a lanyard or clip. Just choose the option that suits you the most. The built-in mixer allows you to mix analog input with Bluetooth or microphone channels without unplugging the cables or disconnecting the wireless connection. The dual microphone system with AGC (automatic gain control) minimises the possibility of getting acoustic feedback. 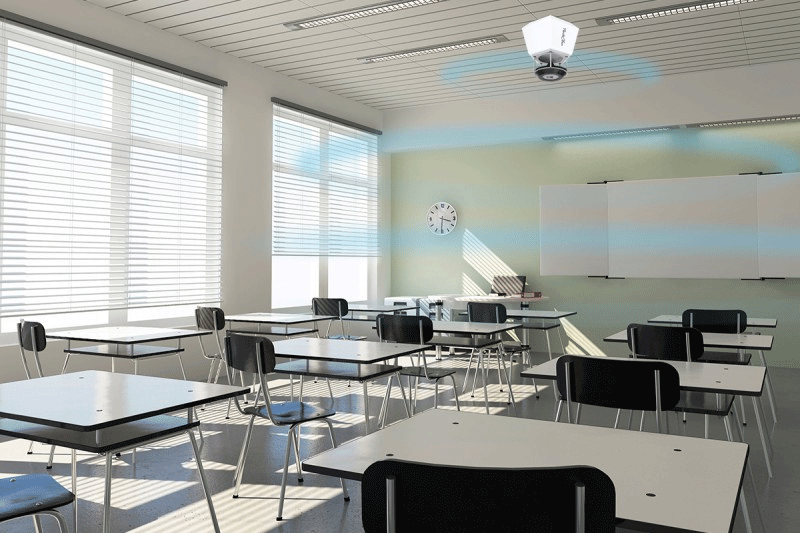 Thanks to its special design, just one Certes PentaClass speaker is able to spread sound evenly in the classroom and is suitable for room sizes of up to 120 m2 (1300 ft2). In case you have an auditorium bigger than 120 m2 (1300 ft2), you can daisy chain up to 3 PentaClasses. The plywood box, aluminium speaker protector and durable plastic parts combine to ensure a long-term lifespan for PentaClass. Thanks to its simple and elegant design, it will fit into any interior. This ensures that only the cleanest frequency bands are automatically selected for the connection between the microphone and PentaClass. The PentaClass microphone uses a state-of-the-art transmitter and receiver that operate in the 2.4 GHz worldwide license-free band. Thanks to digital transmission, you get pristine, high-definition voice reproduction. 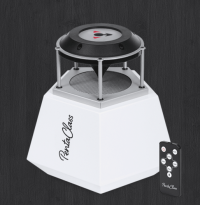 All-in-One device: PentaClass combines the speaker, amplifier and mixer all in one. 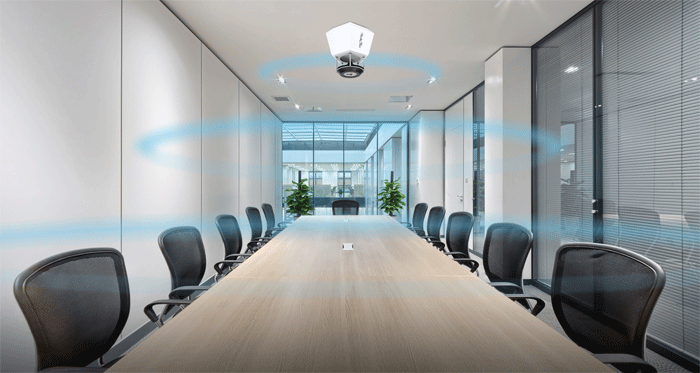 Simple installation: In a matter of minutes you can install PentaClass using the mount on the ceiling or wall. Hi-Fi acoustic design: The PentaClass design ensures sound clarity on voice, the full range for multimedia and a rich bass for music. Audio presets: This allows you to choose the audio mode by switching between voice, multimedia and music presets. System status indication: Depending on the PentaClass status, it will illuminate a specific light. Remote Control: All PentaClass versions come with a remote control for the easy operation of devices. Hearing loop devices ready: Thanks to the mixed Aux output, you can connect PentaClass to any hearing loop device. Power-saving mode: The automatic power-saving mode switches on if there is no incoming signal for more than 20 minutes. Dynamic Range Compression: Whether you are listening at a low or high volume, the DRC ensures the quality of non-distorted sound. 360 Omnidirectional sound field: Enjoy the truly rich sounds whenever you are seated in the classroom. Students’ performance has improved by 30% in classrooms where the classroom audio solutions have been used in the learning process. 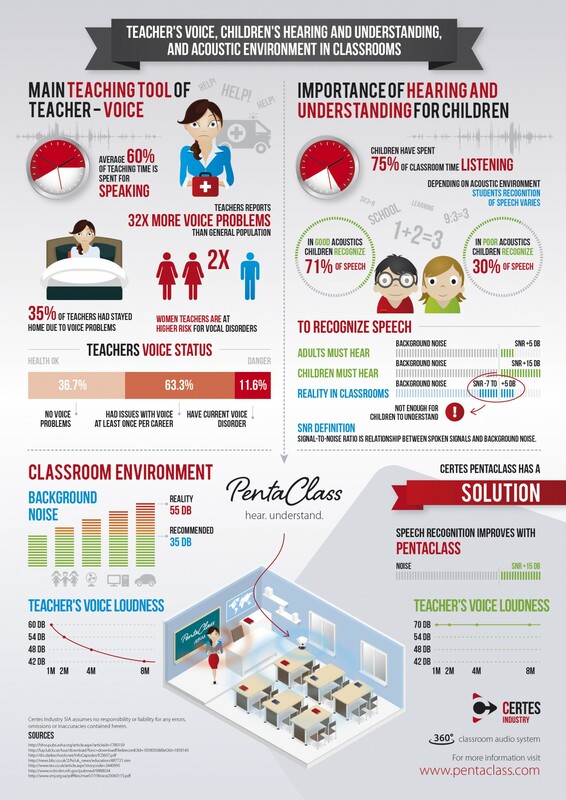 More than 50% of teachers and professors suffer from voice disorders. Children spend 75% of their day listening. In 67% of cases, the background noise in the classroom was louder than applicable laws and regulations allow.